Depicted is a photograph of a reproduction of the Möckli Family crest or Wappen located in the ancestral home in Radhof. This home is still owned and occupied by Karl Möckli, a direct descendent of Hans Jacob Möckli the first Möckli listed in our branch of the Möckli family tree. Hans Jacob lived and died in the 1600’s. His family is just one of seven families stemming from Marthalen. Each branch of the Möckli families in Marthalen have their own distinctive Wappen. 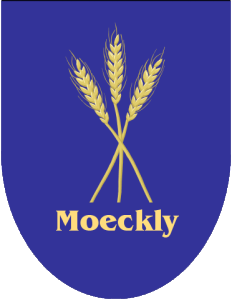 Möckli families can be found in other areas near Marthalen in the vicinity of Basadingen, Kleinandelfingen, Schaffhausen, Schlatt, Diessenhoffen to name a few. Each of these branches has a unique family Wappen. While this depiction in stained glass is very ornate and colorful, the basic elements of the Wappen are three shafts of grain (Ähren) in gold on a shield of blue. This basic Wappen can be found painted on the ancestral house in Radhof owned by Karl Möckli and painted by his wife Leni.